So you've nearly found the dancefloor but you've left yourself one of those fiddly, delicate little chips some three feet off the edge of the green... but what's the best solution? Yes, you could pull out the putter and give it a whack, but the issues there are the ball could pop up and lose momentum and come up well short, or it could skid through the ground and go well past. It can be very difficult to gauge control when using a putter from off the green. Like no doubt many of you, the 56-degree wedge will come out the bag. 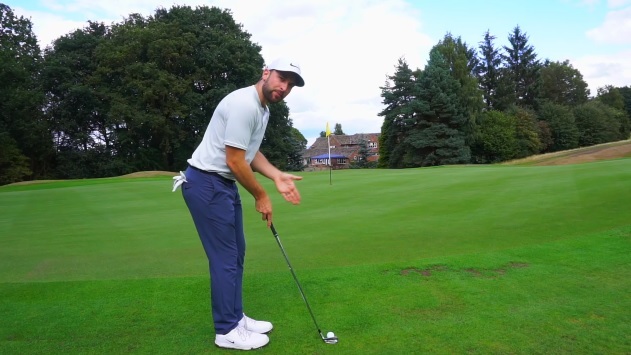 Okay, a neat option if you can execute it properly, but no doubt somewhere along the line you've bladed one across the green off a tight lie before! The hybrid shot around the green is something we'll come to look at soon, and this definitely represents a good alternative as you may have seen a number of guys adopting on Tour, but again, I prefer something else. The classic 'bump and run' is my favourite shot to adopt in these situations. I like to pull out an 8-iron and get the ball running along the ground. From here, I want you to address the ball with a narrow stance and come down the grip for more control. I want you to think about using a putting stroke and get your weight on the left side. Watch the clip below to see how I go about it. Why not give this a go in your next round or practice session. Let us know on social media or in the GolfMagic Forum how you get on.